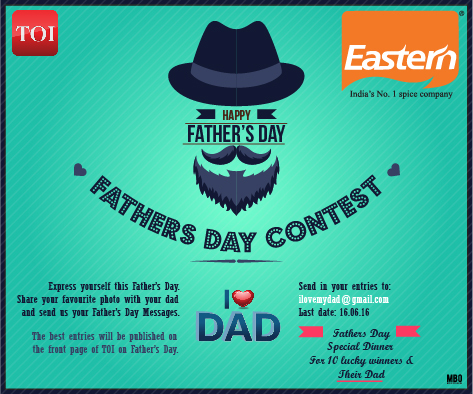 Express your love for your Father at this Fathers Day and win exciting prizes from Eastern. 3.The contest will go live on June 08,2016 and will end at 6:00pm on June 16, 2016 . 4.The participants can email the entries to [email protected] or can submit their entries through Eastern’s official Facebook Account (www.facebook.com/eastern.in) or Twitter Account (eastern_in) or instagram (eastern_in) . 5.The contestants have to use the hashtag #IloveDad and tag Eastern. 6.Ten lucky winners and their dads will get a father’s day special dinner and an exciting gift hamper from Eastern. 7.The winners will be announced on Eastern’s social media accounts and the entries will be published on the front page of The Times of India on 19th June, Father’s day. 8.Winners will be required to send in their contact details to [email protected] or to the social media accounts of eastern. 9.The Prize shall not be transferable / redeemable. No request shall be entertained in this behalf. 11.Eastern /The Times of India reserves the right to change/modify terms and conditions and/or criteria of the Contest at any time at its own discretion and without any prior notice and without assigning any reason. 13.Eastern condiments/The Times of India shall not be responsible for any loss, damage, theft caused to the Prize(s) after handing over the same to the winner/ his/ her assign(s). 14.In case of any dispute or difference in respect of this Contest, the decision of Eastern Condiments / The Times of India’s shall be final.